Our interests focus primarily upon enzymes that catalyse glycoside formation and hydrolysis, since these play crucial roles in all areas of biology. Applications of our research (see below) range from the development of new catalysts for industrial processes to the design, synthesis and testing of new therapeutics. 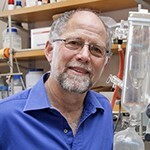 Understanding: Mechanistic studies are the foundation of our program and range from the discovery and analysis of “new” mechanisms by which enzymes catalyse these reactions through to development of a deeper understanding of how the enzymes for which we know the fundamental mechanisms achieve such enormous (107 fold) rate accelerations. The approaches adopted involve a combination of synthetic organic chemistry (synthesis of substrate analogues, inhibitors, etc. ), molecular biology (cloning, mutagenesis, etc.,) and biochemistry (enzyme purification, kinetics, labeling, peptide mapping). These are often coupled with collaborative crystallographic and NMR studies of protein/ligand complexes to gain insights into structures, dynamics and electrostatics of the species along the enzyme’s reaction coordinates. We also utilise mass spectrometry for peptide mapping and gas phase studies. Central to our mechanistic studies are the databases CAZY and CAZYPEDIA. Inhibitors of glycosidases have value both as mechanistic probes and as potential diagnostics and therapeutics. Mechanism-based covalent inhibitors, often based upon fluorosugars, have been designed and used by our lab to prove covalent catalysis, to identify active site residues andto visualize structures of reaction intermediates. These, along with non-covalent inhibitors, are being developed as potential therapeutics in conjunction with B.C.’s Centre for Drug Research and Development (CDRD). Trials are currently underway for new treatments for influenza (neuraminidase inhibition), diabetes (α-amylase inhibition) and lysosomal storage diseases (pharmacological chaperones). These candidates were derived both by design / synthesis and by high-throughput screening of natural product extracts. Engineering: a particular challenge in glycoscience is the efficient assembly of oligosaccharides and glycoproteins – especially on the large scale. We have generated glycosynthases and glycoligases (engineered glycosidases) for the high-yielding assembly of glycosides. Through application of directed evolution approaches that mimic the process of natural selection, but in the laboratory, we are generating improved versions of these enzymes with activities up to 5000 times higher than their parents. Our involvement in the Centre for High-Throughput Biology (CHiBi) is central to such studies. Students interested in genome-wide and high-throughput chemical biology studies are also alerted to our new Genome Sciences and Technology (GSAT) graduate program. Tegl, G., Hanson, J., Kwan, D.H., Santana, A.G. and Withers, S.G. “Facile formation of ß-thioGlcNAc linkages to thiol-containing sugars, peptides, and proteins using a mutant GH20 hexosaminidase” (2019) Angew Chemie In Press, accepted Dec 13th 2018. Du, Ting; Buenbrazo, Nakita; Kell, Laura; Rahmani, Sadia; Sim, Lyann; Withers, Stephen; DeFrees, Shawn; Wakarchuk, Warren “A bacterial expression platform for production of therapeutic proteins containing human-like O-linked glycans.” (2019) Cell Chemical Biology, In Press, Accepted Sept 2018. Perrella, N.N., Withers, S.G., and Lopes, A.R.“Identity and role of the non-Conserved Acid/Base Catalytic residue in the GH29 fucosidase from the spider Nephilingis cruentata” (2018) Glycobiology, 28, 925-932. Tysoe, C.R. and Withers, S.G. “Structural dissection of helianthamide reveals the basis of its potent inhibition of human pancreatic ?-amylase”. (2018) Biochemistry 57, 5384-5387. Gao, Z., Thompson, A., Paulson, J and Withers, S.G. “Proximity Ligation-Based Fluorogenic Imaging Agents for Neuraminidases” (2018) Angew. Chemie 57, 13538-13541. Nasseri, S. A., Betschart, L., Opaleva, D., Rahfeld, P. and Withers, S.G. “A mechanism based approach to screening metagenomic libraries for unconventional glycosidases” (2018) Angew. Chemie 57, 11359-11364. Chen, H and Withers, S.G. “Synthesis of azido-deoxy and amino-deoxy glycosides and glycosyl fluorides for screening of glycosidase libraries and assembly of substituted glycosides” (2018) Carbohydr. Res. 467, 33-34. Irmisch, S., Jo, S., Roach, C., Jancsik, S., Yuen, M., Madilao, L., O’Neil-Johnson, M., Williams, R., Withers, S.G. and Bohlmann, J. “Discovery of UDP-Glycosyltransferases and BAHD-Acyltransferases in the Biosynthesis of the Anti-Diabetic Plant Metabolite Montbretin A” (2018) The Plant Cell, 30, 1864-1886. Kötzler, M.P., Robinson, K., Chen, H-M., Okon, M., McIntosh, L.P. and Withers, S.G. “Modulating the nucleophile of a glycoside hydrolase through site-specific incorporation of fluoroglutamic acids (2018) J. Am. Chem. Soc. 140, 8268-8276. Blaukopf, M., Worrall, L., Kosma, P., Strynadka, N.C.J. and Withers, S.G. “Insights into heptosyltransferase I catalysis and inhibition through the structure of its ternary complex” (2018) Structure 26, 1399-1407. Weber, P., Nasseri, S.A., Pabst, B.M., Gomez, A.T., Müller, P., Paschke, E. Tschernutter, M., Windischhofer, W., Withers, S.G., Wrodnigg, T.M., and Stütz, A.E. “Potent GH20 N-Acetyl-beta-D-hexosaminidase inhibitors: N-Substituted 4-acetamido-5-amino- 1-hydroxymethyl-cyclopentanediols” (2018) Molecules 23, 708. Hettle, A. G., Vickers, A. C., Robb, C.S., Liu, F., Withers S.G., Hehemann, J-H., and Boraston A.B. “The molecular basis of polysaccharide sulfatase activity and a nomenclature of catalytic subsites in this class of enzyme” (2018) Structure 26, 747-758. Smirnova, I., Kasho, V., Jiang, X., Chen, H.-M., Withers, S.G. and Kaback, R.H. “Oversized galactosides as a probe for conformational dynamics in LacY” (2018) PNAS 115, 4146-4151. Macdonald, S.S., Patel, A., Larmour, V.L.C., Morgan-Lang, C., Hallam, S.J., Mark, B.L., and Withers, S.G. “Structural and mechanistic analysis of a Beta-glucoside phosphorylase identified by screening a metagenomic library” (2018) J Biol Chem 293, 3451-3467. Duo, T., Robinson, K., Greig, I., Chen, H., Patrick, B.O. and Withers, S.G. “Remarkable reactivity differences between glucosides with identical leaving groups”(2017) J Am. Chem. Soc 8, 139, 15994-15999. Centko, R.M., Ratnaweera, P.B., Tysoe, C.R., Withers, S.G., Dilip De Silva, E. and Andersen,R.J. “Alpha-glucosidase and alpha-amylase inhibiting thiodiketopiperazines from the endophytic fungus Setosphaeria rostrata isolated from the medicinal plant Costus speciosus in Sri Lanka” (2017) Phytochemistry Letters 22, 76-80. Saxena, H., Hsu, B., de Asis, M., Zierke, M, Sim, L., Withers, S.G. and Wakarchuk, W., “Characterization of a Thermostable Endoglucanase from Cellulomonas fimi ATCC484” (2018) Biochemistry and Cell Biology 96, 68-76. Jongkees, S. A. K., Caner, S., Tysoe, C. R., Brayer, G. D., Withers, S. G. and Suga, H. “Rapid discovery of potent and selective glycosidase-inhibiting de novo peptides” (2017) Cell Chemical Biology 24, 381-390. Gao, Z., Niikura, M, and Withers, S. G. “Ultrasensitive fluorogenic neuraminidase titration reagents” (2017) Angew. Chemie, 56, 6112-6116. Schalli, M. Wolfsgruber, A., Santana, A. G., Tysoe, C. R., Fischer, R., Thonhofer, M., Withers, S. G. and Stuetz, A. “C-5a-Substituted Validamine Type Glycosidase Inhibitors” (2017) Carbohydr. Res. 440, 1-9. Strazzulli, A., Cobucci-Ponzano, B, Carillo, S., Bedini, E., Corsaro, M. M., Pocsfalvi, G., Withers, S. G., Rossi, M and Moracci, M. “Introducing transgalactosylation activity into a GH42 ?-galactosidase” (2017) Glycobiology 27, 425-437. Kuatsjah, E., Chen, H., Withers, S. G. and Eltis, L.D. “Characterization of an extradiol dioxygenase involved in the catabolism of lignin-derived biphenyl” (2017) FEBS Letts 591, 1001-1009. Lebl, R., Thonhofer, M., Tysoe, C.R. Pabst, B.M., Schalli, M., Weber, P., Paschke, E., Tschernutter, M., Windischhofer, W. and Withers, S. G. “A Morita-Baylis-Hillman based route to C-5a-chain-extended 4-epi-isofagomine type glycosidase inhibitors” (2017) Carbohydr. Res. 442, 31-40. Kötzler, M.P., McIntosh, L.P. and Withers, S.G. “Refolding the unfoldable: A systematic approach for renaturation of Bacillus circulans xylanase” (2017) Protein Science 26, 1555-1563. Lizak, C., Worrall, L.J., Baumann, L., Fleiderer, M., Volkers, G., Sun, T., Sim, L., Wakarchuk, W.W., Withers, S.G. and Strynadka, N.C.J. “X-ray crystallographic structure of a bacterial polysialyltransferase provides insight into the biosynthesis of capsular polysialic acid” (2017) Scientific Reports, 7, 5842. Schalli, M., Weber P., Tysoe, C., Pabst, B.M., Thonhofer, M., Paschke, E., Stütz, A.E., Tschernutter, M., Windischhofer, W., and Withers, S. G. “N-Substituted 5-amino-1-hydroxymethyl-cyclopentanetriols: a new family of activity promotors for a GM1-gangliosidosis-related human lysosomal ?-galactosidase mutant” 2017) Carbohydr. Res. 443, 15-22. Li, Z., Fischer, M., Satkunarajah, M., Zhou, D., Withers, S. G. and Rini, J. M. “Structural basis of Notch O-glycosylation by mammalian protein-O-glucosyltransferase 1 (POGLUT1)” (2017) Nature Communications, 8:185, 1-12. Danby P.M. and Withers, S.G. “Glycosyl Cations versus Allylic Cations in Spontaneous and Enzymatic Hydrolysis” (2017) J. Am. Chem. Soc. 139, 10629-10632. Armstrong, Z., Rahfeld, P. and Withers, S.G. “Discovery of New Glycosidases from Metagenomic Libraries” (2017) Methods Enzymol. 597, 3-23. Schalli, M., Weber P., Tysoe, C., Pabst, B.M., Thonhofer, M., Paschke, E., Stütz, A.E., Tschernutter, M., Windischhofer, W., and Withers, S. G. “N-Substituted 5-amino-1-hydroxymethyl-cyclopentanetriols: a new family of activity promotors for a GM1-gangliosidosis-related human lysosomal beta-galactosidase mutant” (2017) Carbohydr. Res. 443, 15-22. Mageroy, M.H., Jancsik, S., Yuen, M.M.S, Fischer, M., Withers, S.G., Paetz, C., Schneider, B., MacKay, J., and Bohlmann, J. “Conifer defense against insects: A white spruce family-1 UGT involved in acetophenone metabolism” (2017) Plant Physiol. 175, 641-651. Duo, T., Robinson, K., Greig, I., Chen, H., Patrick, B.O. and Withers, S.G. “Remarkable reactivity differences between glucosides with identical leaving groups” (2017) J Am. Chem. Soc 8, 139, 15994-15999. Wakarchuk, W., Saxena, H., Hsu, B., de Asis, M., Zierke, M, Sim, L. and Withers, S.G. “Characterization of a Thermostable Endoglucanase from Cellulomonas fimi ATCC484” (2017) Biochemistry and Cell Biology In Press. Centko, R.M., Ratnaweera, P.B., Tysoe, C.R., Withers, S.G., Dilip De Silva, E. and Andersen,R.J. “Alpha-glucosidase and alpha-amylase inhibiting thiodiketopiperazines from the endophytic fungus Setosphaeria rostrata isolated from the medicinal plant Costus speciosus in Sri Lanka”(2017) Phytochemistry Letters 22, 76-80. Danby, P.M. and Withers, S.G. “Advances in Enzymatic Glycoside Synthesis” (2016) ACS Chemical Biology 11, 1784-1794. Solmaz Sobhanifar, Liam J. Worrall, Robert J. Gruninger, Gregory A. Wasney, Markus Blaukopf, Lars Baumann, Emilie Lameignere, Matthew Solomonson, Eric D. Brown, Stephen G. Withers, Natalie C. J. Strynadka. “An intimate look at the structure and mechanism of Staphylococcus aureus TarM, the wall teichoic acid α-glycosyltransferase” (2015) PNAS 112, E576-E585. Yun-Bin Han, Lie Wu, Jamie R. Rich, Feng-Tao Huang, Stephen G. Withers, Yan Feng and Guang-Yu Yang. “Comprehensive Characterization of Sphingolipid Ceramide N-deacylase using HPLC Assays” (2015) Appl Microbiol Biotechnol, 99, 6715-6726. David H. Kwan, Iren Constantinescu, Rafi Chapanian, Melanie A. Higgins, Eric Samain, Aslasdair B. Boraston, Jayachandran N. Kizhakkedathu, and Stephen G. Withers “Towards efficient enzymes for the generation of universal blood through structure-guided directed evolution” (2015) J. Am. Chem. Soc. 137, 5695-5705. Guang-Yu Yang, Caishun Li, Michael Fischer, Christopher Cairo, Yan Feng and Stephen G. Withers. “A FRET Probe for Cell-based Imaging of Ganglioside-degrading Enzyme Activity and High-throughput Screening”. (2015) Angew Chemie 54, 5479-5483. Leslie K. Williams, Xiaohua Zhang, Sami Caner, Christina Tysoe, Nham T. Nguyen, Jacqueline Wicki, David E. Williams, John Coleman, John McNeill, Violet Yuen, Raymond J. Andersen, Stephen G. Withers, Gary D. Brayer. “The amylase inhibitor montbretin A reveals a new glycosidase inhibition motif” (2015) Nature Chem. Biol. 11, 691-6. Spencer S. Macdonald, Markus Blaukopf, and Stephen G. Withers. “N-Acetylglucosaminidases from AZy Family GH3 Are Really Glycoside Phosphorylases, Thereby Explaining Their Use of Histidine as an Acid/Base Catalyst in Place of Glutamic Acid” (2015). J. Biol. Chem. 290, 4887-4895. Andreas Gesell, Markus Blaukopf, Lina Madilao, Macaire M. S. Yuen, Stephen G. Withers, Jim Mattsson, John H. Russell, Joerg Bohlmann. “The gymnosperm cytochrome P450 CYP750B1 catalyzes stereospecific monoterpene hydroxylation of (+)-sabinene in thujone biosynthesis in Thuja plicata” (2015) Plant Physiology 168, 94-106. Gesa Volkers, Liam J. Worrall, David H. Kwan, Ching-Ching Yu, Lars Baumann, Emilie Lameignere, Nichollas E. Scott, Leonard J. Foster, Stephen G. Withers, Natalie C.J. Strynadka. “Structure of human ST8SiaIII sialyltransferase provides insight into cell surface polysialylation” (2015) Nature Struct Mol Biol. 22, 627-635. Steve Arns, Jason Tan, Sharon Sun, Adam Galey, Jay Paquette, Elyse Bourque, Stephen G. Withers, Richard Liggins. “Assessing the Oral Bioavailability of Difluorosialic Acid Prodrugs, Potent Viral Neuraminidase Inhibit, Using A Snapshot PK Screening Assay” (2015) Bioorg Med Chem Lett, 25, 2505-2509. David H Kwan, Sabrina Ernst, Miriam Koetzler. “Chemoenzymatic Synthesis of a Type 2 Blood Group A tetrasaccharide and Development of High-Throughput Assays Enables a Platform for Screening Blood Group Antigen-Cleaving Enzymes” (2015) Glycobiology, 8, 808-811. Ching-Ching Yu and Stephen G. Withers. “Recent Developments in Enzymatic Synthesis of Modified Sialic Acid Derivatives” (2015) Adv Synth Catal 357, 1633-1654. Sheldon Tai, O Agafitei, Z Gao, R Liggins, M Petric, Stephen G. Withers, M Niikura. “Difluorosialic Acids, Potent Novel Influenza Virus Neuraminidase Inhibitors, Induce Fewer Drug Resistant Neuraminidase Mutations than does Oseltamivir” (2015) Virus Research 210, 126-132.